This post is for the Duck Dynasty fans out there! BUT, for those of you that may not be fans, before you tune me out, those of you parenting a special needs child will also be HUGELY blessed by this book…Keep reading! I will admit that this book is a little bit different than what I would usually pick up or even share on this blog and I wasn’t sure what to think at first. BUT, as I got further into this book, I realized what an ENCOURAGEMENT it would be for some of my readers who are parenting with difficult circumstances. I’m so excited to be able to GIVE AWAY a copy of this brand new book! Missy Robertson is the wife of Jase Robertson, one of the Duck Dynasty men! The title of her new book is: Blessed, Blessed . . . Blessed: The Untold Story of Our Family’s Fight to Love Hard, Stay Strong, and Keep the Faith When Life Can’t Be Fixed . You can also read more about this book on the website: Blessed, Blessed…Blessed. I enjoyed reading some of the “back story” of this family who, up until a few years ago, seemed to be a typical American family just living life trying to please the Lord. It is always interesting to me to read about these everyday families before they were famous! I always love to read about faithful followers of Jesus who were faithful before they had the fame and fortune, and this seems to be the case for the Robertson family. 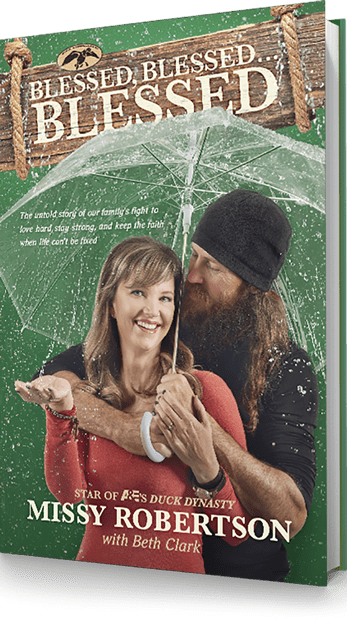 Missy and Jase Robertson tell the story, in this new book, of how their family started…their dating relationships, their marriage and then the beginning of a family with children. They share the excitement they felt at having 2 wonderful boys and learning that their third baby would be a girl. That excitement turned to fear when an ultrasound showed problems with their precious baby girl, Mia. In her book, Missy outlines the fears, the heartbreak, the grieving their family went through at different stages of Mia’s birth and multiple surgeries. But, what I love most is the HOPE that Missy shares in this book. She tells the heartbreaking facts, yet she also tells us that she has grown to be excited for Mia’s calling on her life and how God has used her disability to bring joy to others and to bring the love of Christ to others. I cannot tell you how much I love the stories of faithful Christ followers who are transparent with us and tell us about the hard times, the excruciating times…yet go on to give glory to God! That is probably what I love most about this book! This give away is now closed. The winner is: Jenn K. Thank you all for entering! !